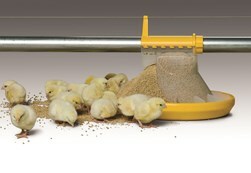 LANDMECO's unique pan feeding system is designed as simply and functionally as possible in order to ease the work of the poultry producer. The most unique features are the two patented functionalities: Kick-off and Easy Clean. Kick-off: Centrally controlled overfilling of all pans at the same time, ensuring the best start for the day-old chicks. Easy Clean: The system also provides the possibility of bringing all pans on a feed line into cleaning position by one single operation (central rotation of the pipe), which simultaneously closes all outlets.